Ectopic pancreatic tissue, also known as a pancreatic rest, is an uncommon congenital anomaly defined as extrapancreatic tissue located far from the pancreas and without any connection via vascular or anatomical means. The pancreatic rests are usually asymptomatic, but a variety of clinical symptoms have been described in the literature. This report describes the clinical scenario of severe dyspeptic symptoms of eight weeks duration in a young female. She underwent upper gastroscopic examination, which revealed a nodular lesion in the antral portion of the stomach. After partial gastrectomy and proton pump inhibitors of 1-month duration her symptoms improved. 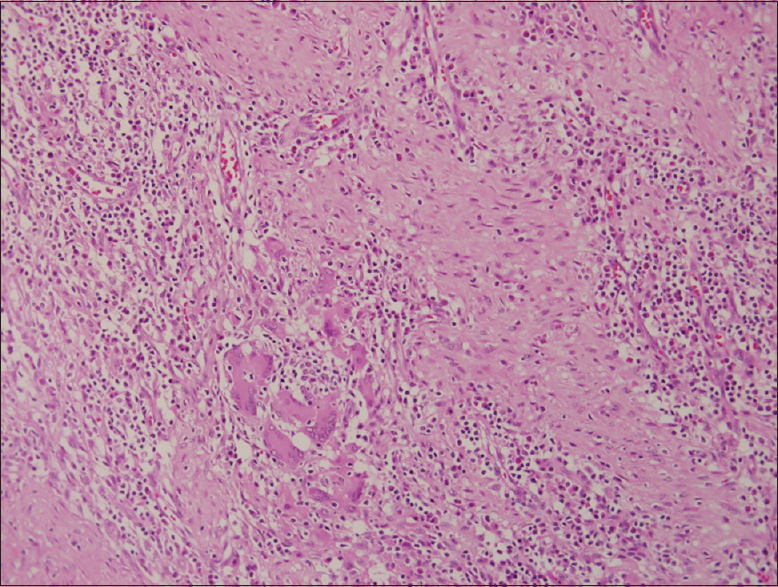 The histological specimen revealed the presence of pancreatic rest and no evidence of malignancy was noted. The patient is symptom-free and has been followed up in our clinic for the last 18 months. 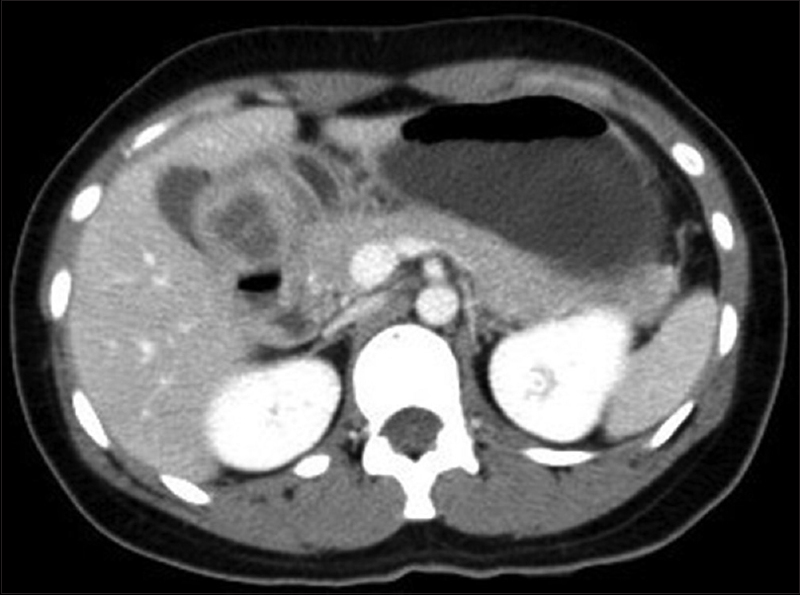 The pancreatic rest, is an uncommon congenital anomaly. The incidence in autopsy series varies from 1 to 2% (range 0.55 to 13%). Such tissue may occur throughout the gastrointestinal tract but has a propensity to affect the stomach and the proximal small intestine. Histological features of acinar formation, development of ducts and independent blood supply are usually present. Accordingly four types have been described, type I having more resemblance to normal pancreatic tissue and type IV showing only islets cells. Although the cause of pancreatic rest remains unclear, several theories, including the 'theory of metaplasia,' the 'theory of misplacement' and the latest addition, the 'theory of abnormalities of notch signaling', have been proposed to explain the pathogenesis and occurrence of pancreatic heterotopia. While majority of patients with pancreatic ectopic tissue are asymptomatic, a variety of symptoms are attributed to this ectopic tissue. Depending upon location and bulk of the pancreatic rest the symptoms may include, gastrointestinal bleeding, gastric outlet obstruction, gastric ulceration, pancreatitis and even obstructive jaundice, when located near Ampulla of vater have been described. There are reports when such lesions have presented with acute perforation, what may reflect pancreatitis of stomach and duodenum. When discovered during endoscopic examination it is very important to differentiate these lesions from submucosal tumors and appropriate surgery may be required to confirm the lesion when results of fine needle aspiration are inconclusive. Despite the advent of novel diagnostic modalities, including endoscopic ultrasonography (EUS), computer tomography (CT) and even EUS-guided fine-needle aspiration (EUS-FNA), the differentiation from a neoplasm at times remains a clinical challenge. When in a given case FNAC has proved it to be pancreatic rest and the patient is asymptomatic, such lesions can be monitored. Endoscopic features of this rare entity and a brief review is presented in this report. A 37-year-old female presented with a history of epigastric pain of 8 weeks duration. The pain had an intensity of 7/10 and was a burning type of pain with no reference or radiation. She stated that for the previous 2 weeks her pain was aggravated by food intake. She denied any alarming symptoms in the form of loss of appetite and weight loss. There was no history of vomiting or melena. Her clinical examination was normal and on evaluation, her hemoglobin levels were 14 g/dl. She had a normal leukocyte count, and liver function and renal function were normal. Serum lipase and amylase levels were not elevated. An ultrasound of her abdomen did not indicate the presence of gallstones and all other organs were normal. She underwent upper gastrointestinal (GI) endoscopy to rule out a gastric ulcer due to the pain being aggravated by food. An upper gastroscopic examination revealed normal esophagus. There was 5 cm × 4 cm bulge in the antral portion of her stomach, and the overlying mucosa was erythematosus [Figure 1]. The fundus and body of the stomach were normal. There was no evidence of duodenal ulcer or growth. A biopsy from the antral portion revealed chronic gastritis, but there was no evidence of Helicobacter pylori. She underwent endoscopic ultrasound (EUS) due to the nodular lesion. The EUS showed a round intramural (subepithelial) lesion in the antrum of the stomach. The lesion was hypoechoic and seemed to appear from the submucosa and measured 30 mm in diameter. The outer endoscopic borders were well-defined. The EUS did not show any lymph nodes in the vicinity, and the liver was normal. The differential diagnosis of gastrointestinal tumor (GIST) was considered and fine needle aspiration was performed after color Doppler imaging ruled out the presence of vascular structures along the needle track. However, the microscopic examination [Figure 2] showed no evidence of malignancy and immune cytochemistry for K-ras was negative for GIST. Abdominal computerized tomography confirmed that apart from a submucosal lesion in the pylorus of the stomach all other organs were normal on imaging. Figure 2: Computerized tomography scan abdomen showing normal pancreas. As a result of the mass lesion in the stomach, the patient underwent partial gastrectomy to determine the nature of this gastric lesion as fine needle aspiration had not clearly identified the lesion. The microscopic examination of the resected portion identified islands of pancreatic acini and ducts in the muscularis propria of the stomach. Several dilated ducts were seen extending through all the layers of the muscularis propria. There was evidence of fibrotic reaction and scant mixed inflammatory infiltrate was observed in the area. There was no evidence of malignancy and the immunocytochemistry CA19-9 was positive in the tissue while CK20 chromogranin was negative in the specimen. The overall microscopic features were consistent with pancreatic rest and GIST was ruled out. [Figure 3] The patient had an uneventful postoperative course and was discharged home after 6 days of hospitalization. She was prescribed oral proton pump inhibitors 20 mg once daily for 1-month duration only. The patient, who did not take any medication for this complaint after the initial proton pump inhibitors, is now pain-free. She has been followed up by the clinic for the last 18 months. Figure 3: Histology showing pancreatic rest. The results of a recent meta-analysis showed the overall pooled prevalence of noninvestigated dyspepsia was 21%. The index case had classical dyspeptic symptoms, which are common worldwide, but as there was no response to conventional treatment, an upper gastroscopy was undertaken to rule out any other cause of her symptoms. It was found that she had an antral lesion which proved to be pancreatic rest. Her symptoms completely obviated after the removal of pancreatic rest. The first description of this condition was given by Hunt and Bonesteel in 1727 who described it as being present in a diverticulum of the ileum. Many reports with different presentations have been described in the literature since then. The incidence of pancreatic rest in autopsy series varies from 1 to 2% (range 0.55 to 13%). Although it can be found anywhere in the foregut and the proximal-midgut, the most common site is the stomach. With the advent of EUS combined with FNA, the overall diagnosis of submucosal gastric lesions have advanced. The endoscopic differential diagnosis was GIST but FNAC ruled it out. EUS features of pancreatic rest usually correlate with specific histologic components. Often a heterogeneous acoustic image and the sonographic layer of origin of the lesion are observed. The endoscopic appearance of pancreatic rest is usually that of a firm, slightly irregular nodule in the stomach or elsewhere in the GI tract but cystic appearance on EUS has also been reported. The size of the nodules may vary from 0.2 to 4.0 cm in diameter. The mucosa over the nodule may be smooth or have a central depression and ducts may empty into the lumen at this site. The other differentials of this endoscopic appearance include a stromal cell tumor, lymphoma, carcinoid, and adenomatous polyp. The present case highlights that pancreatic rest is an unusual cause of dyspepsia and underlines the importance of endoscopic examination in a young patient, irrespective of alarm symptoms, after failure of proton pump therapy. Lovell RM, Ford AC. Global prevalence of and risk factors for irritable bowel syndrome: A meta-analysis. Clin Gastroenterol Hepatol 2012;10:712-21.e4. Pearson S. Aberrant pancreas. Review of the literature and report of three cases, one of which produced common and pancreatic duct obstruction. AMA Arch Surg 1951;63:168-86. Kaneda M, Yano T, Yamamoto T, Suzuki T, Fujimori K, Itoh H, et al. Ectopic pancreas in the stomach presenting as an inflammatory abdominal mass. Am J Gastroenterol 1989;84:663-6. Matsui M, Goto H, Niwa Y, Arisawa T, Hirooka Y, Hayakawa T. Preliminary results of fine needle aspiration biopsy histology in upper gastrointestinal submucosal tumors. Endoscopy 1998;30:750-5. Matsushita M, Hajiro K, Okazaki K, Takakuwa H. Gastric aberrant pancreas: EUS analysis in comparison with the histology. Gastrointest Endosc 1999;49(4 Pt 1):493-7. Riyaz A, Cohen H. Ectopic pancreas presenting as a submucosal gastric antral tumor that was cystic on EUS. Gastrointest Endosc 2001;53:675-7. Shah A, Gordon AR, Ginsberg GG, Furth EE, Levine MS. Case report: Ectopic pancreatic rest in the proximal stomach mimicking gastric neoplasms. Clin Radiol 2007;62:600-2. Gunjaca I, Mlinac-Lucijanic M, Pavlovic A, Gunjaca M. Inflammation of ectopic pancreatic tissue as unusual cause of duodenal perforation – A case report. Coll Antropol 2010;34:1119-22. Filippou DK, Vezakis A, Filippou G, Condilis N, Rizos S, Skandalakis P. A rare case of ectopic pancreas in the ampulla of Vater presented with obstructive jaundice. Ann Ital Chir 2006;77:517-9. Mulholland KC, Wallace WD, Epanomeritakis E, Hall SR. Pseudocyst formation in gastric ectopic pancreas. JOP 2004;5:498-501. Monedero MD, Ripollés T, Nicolau MJ, Martínez-Pérez MJ. Pancreatic pseudotumor in Meckel diverticulum. Abdom Imaging 2006;31:688-90. Ugur Kantar F, Akarsu M, Atilla K, Sagol O, Soytürk M, Akpinar H. Ectopic pancreas presenting with intractable diarrhea: Case report. Turk J Gastroenterol 2011;22:426-9. Kim KJ. Endoscopic resection of ectopic pancreas in the minor papilla. Endoscopy 2009;41 Suppl 2:E12. Barrocas A, Fontenelle LJ, Williams MJ. Gastric heterotopic pancreas: A case report and review of literature. Am Surg 1973;39:361-5.